As any serious (or not-so-serious) SCUBA diver knows, Cozumel is surrounded by one of the most fantastic coral reef formations in the world. Tunnels, caves, and pinnacles form a magic garden landscape of brilliant corals and walls that can drop over 3,000 feet to the ocean floor. A large variety of exotic marine life thrives in these reefs …the water is so clear that visibility often reaches 100 ft and more. Cozumel is Mexico's largest island. 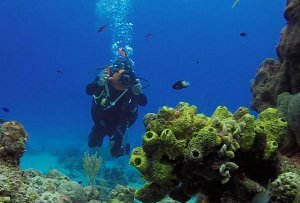 The friendly, laid-back tropical island atmosphere, world class dive operators and stunning Caribbean beauty makes Cozumel the dive resort destination of choice for thousands of experienced SCUBA divers from around the world… it's a hands down favorite of the pro seeking unpretentious comfort and authentic Bohemian charm. The jewel-shaped island lies just 12 miles off the Yucatan Coast. Its jungle-clad interior and ivory white beaches are girdled by one of the most spectacular ensembles of coral reefs in this hemisphere. Surrounding Cozumel's limestone shore is the mythical clear water ranging in colors from stunning turquoise to deep indigo. We are professional family dive business owned with more than 30 years dive experience in Cozumel Reefs with a clean record of no one single accident during all this long period of time.. We at Aquatic Sports are committed not only to give you the best and safest diving experience at Cozumels reefs, but to make a permanent and friendly relationship with our guests. 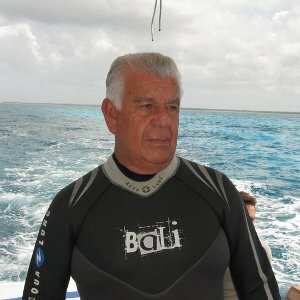 Sergio Sandoval Vizcaíno, is the owner and full time executive &quo;DM&quo; at Aquatic Sports / Deportes Acuáticos Cozumel. Sergio was born in Sayula, Jalisco and raised along the shores of Manzanillo harbor free diving with the oyster fishermen. In 1967 Sergio received his degree in Mechanical Engineering and spent more than 17 years as a mechanical engineer in the automotive industry. Aquatic Sports/ Deportes Acuaticos Cozumel is a NAUI certified school and dive operator. Small groups… 6 to 8 divers per trip. Personalize your dive trip …choose the site. Smooth rides… modern and well equipped boats. Safety record… 30 years accident free! Two tank dive day… 8:45 AM - 1:30 PM. Afternoon and night dives by request. Lunch on board… native fruit, meat and pastries. Custom dive trips… all levels of experience. Nitrogen/Oxygen (EANx) tanks… available. Computer diving… we are computer specialists Equipment rental…*always available and ready PADI NAUI & SSI certified instructors on staff. Certification and specialty instruction available. 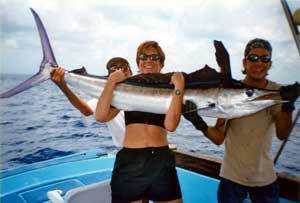 We try our best to assure that your Sport Fishing experience with us is special. Our Captains and crew members are tournament winning anglers and seasoned fishing guides. Most of these guys were born and raised on the island and know just where to find. our marlin, sailfish, wahoo, and dorado So…if you have a few in your group who would prefer to spend the day fishing rather than SCUBA diving…I know, thats hard to believe, we can provide the same professional service on the water as we do under the water. Just let us know what we can do for you!